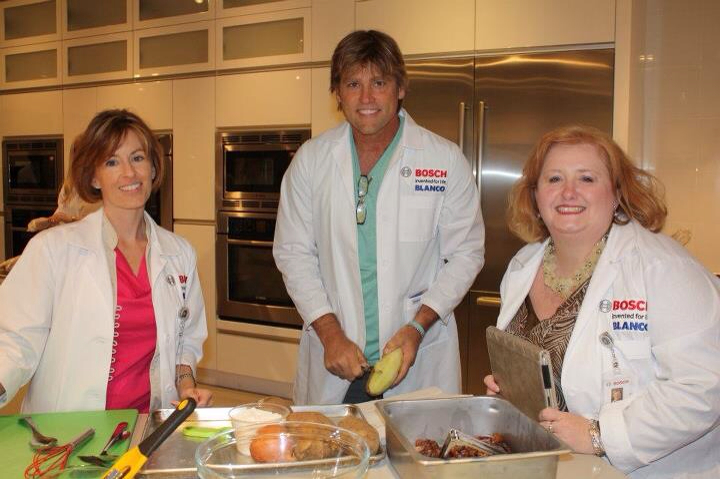 Last month as part of my trip out to the Bosch Experience and Design Center in Irvine, CA I had the opportunity to learn more about induction cooking and to make a meal using one. And I must say that I am love! My last stove top was a glass top electric and I really liked the shiny, smooth surface which was easy to clean and always looked great. But, you do have to keep in mind that it may be very hot for a while after use and it’s easy to forget that. With an induction cooktop, the only actual heat on the surface of the cooktop is the residual heat from the food in the pan, not the surface itself. Here is a video from Bosch explaining how it all works. A really great feature is that induction uses up to 60% less energy than gas and is every bit as adjustable, and cooks food twice as fast as electric. Here we are having induction cooking demonstrated for us. The water in the sauce pan was at a full rolling boil in seconds, it was amazing. And here is an egg that will cook only on the area where the pan and cooktop are in contact and how cool the surface is right next to it. Actually, this feature also speaks to how much easier it is to clean these glass tops vs those on electric cooktops. Since the induction cook top never gets very hot, spilled food doesn’t bake onto the surface and can be wiped away immediately as if it were on a counter. The sleek black cooktop which combines European design with German engineering reminds me of an iPhone or iPad surface, especially as the controls are embedded in the glass. It’s no surprise though, as Apple’s Steve Jobs was very influence by design work of Dieter Rams, whose ” 10 principals of good design” are literally etched in the walls of the Bosch Experience center in California.